Drive through the provinces of Malaga and Cadiz and you will encounter, scattered around the countryside, many ‘Pueblos Blancos’ – white villages and towns. Although they vary in size and topography they all share many features: whitewashed houses - some decorated with brightly coloured flower pots; red and brown tiled rooftops; historic buildings; cobbled streets; narrow alleyways and, in most cases, a scenic countryside view. Dating back over many centuries, the Pueblos Blancos are renowned for their beauty as well as impressive surroundings and are best explored on foot. On arrival at Malaga airport, collect your hire car and self drive to the Catalonia Reina Victoria Hotel in Ronda (90 minutes). Originally built in 1906, the hotel is located within walking distance of the historic centre and offers views over the Tajo Gorge. Ronda is one of the oldest towns in Spain, with a deep gorge which splits Ronda in two. Head to Puente Nuevo, the ‘new bridge’, which stands over the El Tajo Gorge, from where you will have a dramatic view down into the chasm. Further along, the road leads to the picturesque square of Duquesa de Parcent, home to a convent, the church of Santa Maria del Mayor and the Town Hall – all remarkable buildings of historic significance. Near to Puente Viejo, the ‘old bridge’ you will find an ancient Arabic Hammam which has been exceptionally well preserved. Overnight at the Catalonia Reina Victoria Wellness and Spa, Andalucia. Drive to nearby Benaojan, 25 minutes by car, a village of Moorish origin and, approximately 2km from there, you will find La Cueva del Gato (Cat's Cave). The Cave of La Pileta, famous for its prehistoric rock paintings, is on the road which takes you to Cortes de la Frontera. Cortes de la Frontera is 25 minutes from Benaojan and contains the ruins of the Roman city of Saeponta as well as the El Paso Tower - a middle-age construction, and a Mozarabic church. Other Pueblos Blancos which can be visited include Jimena de Libar, 20 minutes from Benaojan; the small village of Atajate, 11 minutes from Jimena de Libar and Algatocin and Benadalid, both between 10-15 minutes drive from Atajate. After breakfast, drive to the Fuerte Grazalema Hotel which is located 5km from the village of Grazalema. The drive takes approximately 30 minutes and, although not in the village itself, the hotel offers a great location for outdoor activities such as walking, hiking, horse-riding, kayaking and cycling. Grazalema is a traditional and attractive village with a main square, the Plaza de Espana, which is filled with restaurants and bars. The Sierra de Grazalema has its own microclimate and, due to being the first high area that sea winds hit when coming in from the Atlantic, it is known to be the wettest place in Spain. Overnight at the Fuerte Grazalema Hotel, Andalucia. The nearby white villages of Benaocaz (20 minutes drive) with its Nazari neighbourhood - the oldest part of the village; picturesque Ubrique (30 minutes drive) with its rich history and famous leather industry; and Villaluenga del Rosario, the highest village in the province of Cadiz (15 minutes drive) with its caves dating back to the Neolithic period are all worthy of a visit. Slightly further away, 50 minutes drive is Prado del Rey whose highlights include the nearby (4km) archaeological site of the Roman city of Lptuci. After breakfast, drive to Los Tadeos Hotel in Zahara de la Sierra. Perched on the edge of the village, the hotel is an excellent base from which to explore the Grazalema Natural Park. An old mountain road connects Grazalema with Zahara de la Sierra which, although scenic, taking you past Puerto de las Palomas viewpoint, is a winding road with steep slopes and is not recommended for a night drive. Overnight at the Los Tadeos Hotel, Andalucia. 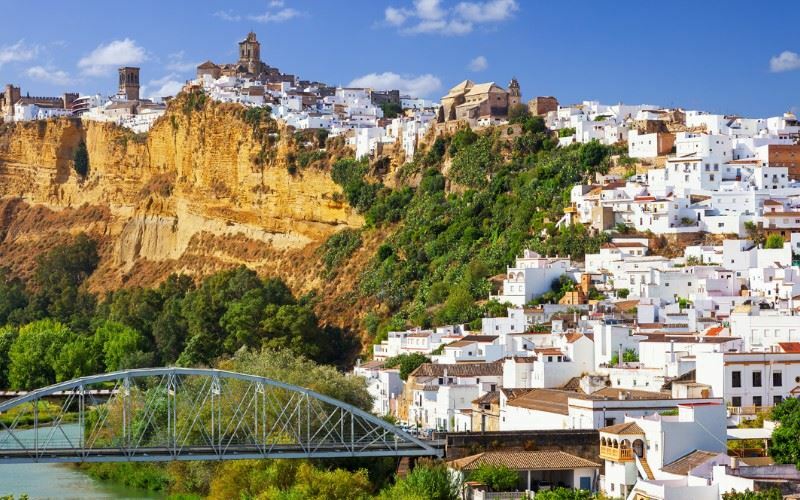 Small in size, the white hilltop village of Zahara de la Sierra can be explored on foot from Los Tadeos Hotel. The heart of the village is the Plaza Major, Zahara's main square, where you will find the Church of Santa Maria de la Meza. Its Moorish castle, with its lookout tower - the 'Torre del Homenaje', sit above the village and a picturesque view over the surrounding countryside can be enjoyed from here. Using Zahara de la Sierra as a base it is also feasible to visit the white villages of El Gastor (30 minutes drive), known as the ‘Balcony of the White Towns’ and Algodonales (20 minutes drive), both of which boast archaeological remains, or the cave dwellings of Setenil de las Bodegas (50 minutes drive). After breakfast, drive to La Casa Grande in Arcos de la Frontera (1 hour) - the gateway to the Pueblos Blancos. La Casa Grande, built in 1729, hugs the cliff edge of the old town and has a Moorish charm. The main square of the old town, Cabildo Square with its Pena Nueva viewpoint, are within walking distance of the hotel. Please note that parking is difficult in the old town and Sunvil would recommend initially parking in the new town and walking to La Casa Grande for directions as to where it is possible to park. 20km from Arcos de la Frontera is Algar, a village of Arabic origin, which is bordered by two natural parks – Grazalema and Alcornocales. Espera, located 14km north of Arcos de la Frontera has a rich history which includes nearby Roman ruins. Medina Sidonia, an ancient hilltop town with an impressive Moorish gate, the Arco de la Pastora, is another gem in the province of Cadiz and 40 minutes away. Overnight at the La Casa Grande, Andalucia. After breakfast, drive to Seville airport (75 minutes) for your return flight to the UK. The property was originally opened in 1908 in Victorian style and was totally renovated in 2012. With views over the Tajo Gorge and set in mature gardens of 3,000sqm, yet within the town, and within easy walking distance (c.500 metres) to the many restaurants, cafes, bars and shops of this vibrant town, the location of the property is perfect. The oldest bullring in Spain, now a museum (only used once a year in September for bullfighting), and the dramatically located New Bridge are a short walk away. Whether to use the hotel as a base from which to explore the town and the surrounding dramatic landscape or just relax by the pool in the gardens is the only difficult choice to be made. The hotel nestles within the spectacular, mountainous Sierra de Grazalema Natural Park and is 5km away from the village. The hotel nestles within the spectacular, mountainous Sierra de Grazalema Natural Park and is 5km away from the village. It is also only 20km from Ronda. Ideally located for walking, hiking, cycling, kayaking and horse riding this is a very friendly, family orientated hotel with activities for children, large rooms with extra beds and interconnecting rooms. Views from the hotel and the pool area over the Guadalete river valley and towards the village of Grazalema are breathtaking. The restaurant specialises in local gastronomy and game dishes. There is something for everyone in this hotel which even has a ‘Responsible Measures’ tour which highlights the measures the hotel takes to conserve energy and respect the environment. Other activities include a botanic tour, a cocktail and Sangria workshop and how to make Gazpacho, the traditional Andalusian soup. The Tadeos is located about 500 metres from the village of Zahara and its castle. It is an excellent base for all activities in the Grazalema Natural Park which caters for walkers, hikers and horseback riders. The Tadeos is located about 500 metres from the village of Zahara and its castle. It is an excellent base for all activities in the Grazalema Natural Park which caters for walkers, hikers and horseback riders. The lake also facilitates water sports. The views from the hotel to the Lijar Mountains are panoramic, especially from the infinity swimming pool. The restaurant features fresh local produce and the tapas are particularly good. The Tadeos is owner managed and decorated in typical Andalusian style. A very homely hotel, well located and a good centre for visiting the surrounding region as Ronda, Grazalema and other White Villages are within an easy drive. Located right on the cliff edge of the old town, this tiny family run hotel has a moorish charm reflected in the decor of the rooms. The property was built in 1729 in the style of former palatial houses and was converted into this friendly bed and breakfast rural inn in 1998.